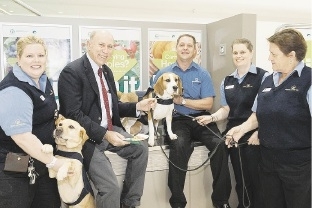 Quarantine detector dogs and officers with Agriculture and Food Minister Ken Baston at Perth domestic airport. This has prompted Agriculture and Food Minister Ken Baston to comment that frontline biosecurity defence was vital. �Being able to stop the risk at the WA border not only protects our agricultural industries but provides a competitive market advantage,� he said. Quarantine inspections intercepted 109 significant pests which included mango seed weevil in mangoes, coffee bean weevil in bananas, light brown apple moth in cherries, geometrid moth in cut flowers and sweet potato weevil in sweet potatoes. For the 2014-15 financial year, a continued strong border quarantine program resulted in the prevention of exotic pests and diseases entering the State, enabling WA to maintain area freedom from many pests and diseases found in other States, Mr Baston said. Biosecurity was a shared responsibility of the whole community. �It is important to understand how something as simple as bringing a piece of fruit or plant material into Western Australia can impact on our agriculture industries if it is harbouring pests or diseases,� he said.